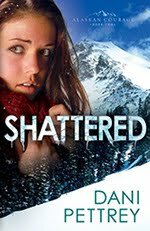 I had the chance to read Shattered early thanks to Netgalley...and I couldn't have been happier! Having read Dani's debut novel, Submerged, I'd already been introduced to the main characters, Landon and Piper. (Submerged is not required reading material, you could easily start here, but you'll want to go back!) And with that small introduction, I was left hungry for more. I happily give Shattered 5 stars out of 5 and even more happily let you know that Shattered releases today! Pick it up, snuggle in, and enjoy your weekend. Okay, I'm kind of mad at myself now because Submerged has been sitting on my bookshelf for a long time now and I still haven't read it. (Been busy reading some ARCs for reviews.) But I'm just about to finish a book this weekend, so Submerged is next. Yaaay! And then I'm sure I'll be antsy for Shattered! I'm totally looking forward to reading this one! I loved Landon and Piper's story in the first book! Thanks for introducing me to Dani and her books. I'll have to check them out. Hope you're doing we'll, Susan!